For a change from the usual games that you see at all the big online casinos, sometimes I like to play at casinos with games from Rival Games, like Desert Nights Casino. They've just introduced a new game from Rival Games called Pistols & Roses. Until the end of August you can claim a deposit bonus up to $625 and when you do they'll throw in $17 worth of free play on the new motorcycle gang–themed game. 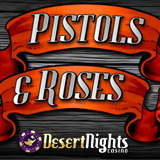 Pistols & Roses is basic three reel, single payline slot, a gritty new game with thug stuff like guns, bullets and tattoos on its reels. Get a $17 freebie to try the new game from Rival. Desert Nights recently re-launched with a slick new look, amazing new casino software from Rival Games, and an all new mobile casino featuring two brand new mobile slot games, Mystic Wolf and Golden Gorilla.